SPOILERS – so if you don’t want to know what happens in issue 69 of The Walking Dead, other than it being MAGNIFICENT, then turn away NOW. Well, issue 69 just about made it for January (Diamond said it was shipping one week, and then it didn’t, then the week after….). But that is absolutely the ONLY negative thing I am going to say about a CRACKER of an issue. This issue seems to be a bit of a release for Kirkman and Adlard. I know that it can often be said that The Walking Dead doesn’t necessarily need ‘the walking dead’ in an issue for it to be marvellous – and I agree with that – but blimey, when you read issue 69, you will probably argue that seeing a few more zombies wouldn’t hurt at all. The set-pieces and action sequences are stunning. And that is what I mean about this issue being a bit of release – all that pent-up revenant action comes bursting out of the creative team. And it is messy. Kirkman throws some zombies and a rescue into the mix – and then lets Adlard take centre stage and shine. His artwork (with sterling help from Rathburn), is a tour-de-force of wrecked highways, devastated City streets and some splash pages that are some of the best zombie apocalypse scenarios I have seen. There is so much to enjoy – and wait til you get to the bit when the cavalry turn up – it’s like that bit in The Two Towers when Gandalf and the Riders of Rohan come to the aid of the besieged Helms Deep. Well – nearly as good as that anyway. It’s a very, very cool moment. But next issue will need to be at the top of its game to come near the majesty of #69…. Couple of points – Rick had a very unusual expression on his face on the final page. Couldn’t work out quite what was going on. I assume he was happy, but he looked like he was going cross-eyed as well. Didn’t detract from the enjoyment, just found it a bit strange. Anyone else notice that? Anyone care to comment on Ricks state of mind at that moment in time? Second point is that in ‘Letter Hacks’, Kirkman mentions that there are big plans for issue 75 – which will be happening this year, and that the ‘on time in ’09’ pledge is to continue on throughout this year, with this issues late shipping a mere blip. Good stuff. deserves your attention. It looks twisted in that very special Ben Templesmith, where pure evil, dread suffering and pain, drips from every panel. I cannot wait. 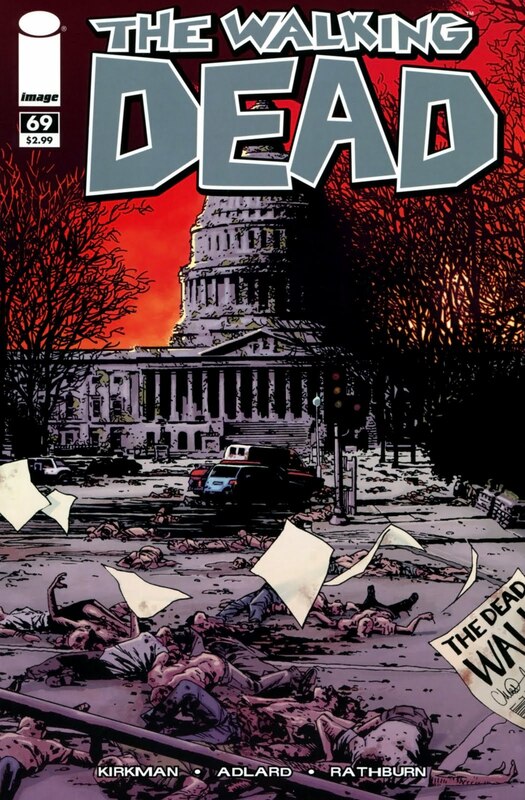 The Walking Dead #69, the best comic book on the market, is out now.